You simply won't find a more feature packed motor and gearbox combination for the price. Internal Thermal Protection, High Grade Sealed Bearings, Class F (155°C) wiring throughout the motor, long life, high temperature Grease for the Gearboxes! Based on the original "Oriental Motor Company" motor with a heat sinked case together with active fans in the higher wattage motors for highly effective heat dispersion. The entire 90mm range uses just one gearbox, so from 40w to 120w so you get the much more durable 19.6Nm gearbox for the lower wattage motors requiring high ratios for big torque without the need to upgrade to a higher wattage motor! Supplied in a Terminal Box configuration (apart from all 6w motors, Speed Control motors and Electromagnetic Brake motors), because beside the fact they are more popular than lead wire types, they can easily be converted to lead wire just by removing the Terminal box and Terminal mounting block! we now have hundreds of these motors and gearboxes scattered across Australia and have yet to recieve single complaint, issue or fault. Some of these motors run 24/7 in continuous stop/start scenarios in some of the worst environments for motors to work in (food processing plants etc). The Titan range is true to label. 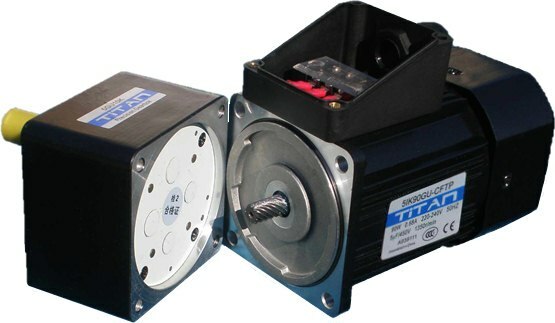 They will output exactly what the label states, if its a 25W you get 25 watts of power, if its a 120w you get 120 watts of power, unlike other budget brands who sell you a 90W motor with a massive output of 74 Watts or worse..
Click Here to view the Titan Motor Range! The uses are as diverse and varied as the people we sell to. We have a customers using these for industrial automation systems running 24/7, customers that use these for Oyster sorting, small elevators and lifts, customers in the food processing industry, hobbyists, shops that buy to resell, it's even found its way into a small conveyor oven manufactured in Australia by a well known company! The build quality and overall reliability have seen it used by a wide variety of people over a multitude of different industries. Induction, Reversible, Speed Control (Constant Speed) and Electro-Magnetic Brake Type motors. 16 Titan prototype gearboxes (assorted ratios and sizes), all pulled down and cleaned to check wear levels after 19 days of continuous full load operations. This is how the gears should look, showing only settling wear! Available through Motion Dynamics and various stockists throughout Australia.